The commemorative ceremonies begin at 11 a.m. with the arrival of An tUachtarán Mary McAleese and a Presidential Guard of Honour. Representatives of the various Faith Traditions in Ireland will then participate in a prayer service. 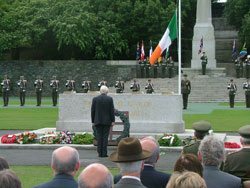 The President will lay a wreath in honour of those Irishmen and Irishwomen who died in past wars or on service with the United Nations. Honours will be rendered by a Cadet Guard of Honour and the Last Post will be sounded. The National Flag will be raised to full mast and Reveille will sound, followed by the National Anthem. 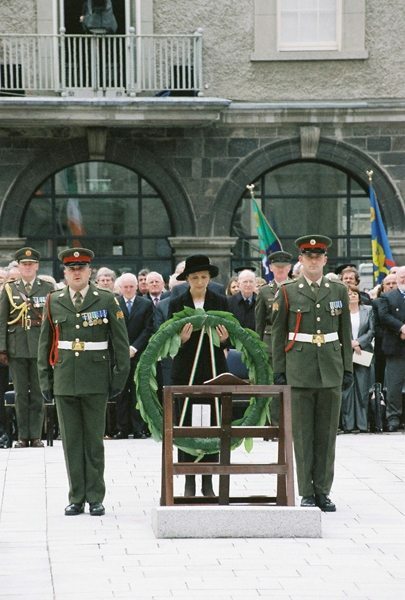 The Royal British Legion, Republic of Ireland District, will host its Annual Wreath Laying Ceremony at the Irish National War Memorial, Islandbridge, Dublin on Saturday the 9th July 2011 at 3 pm. Royal British Legion Branches from the Republic of Ireland, from Northern Ireland and other Ex-service and Regimental Organisations from the Republic of Ireland will be invited to parade their Standards at the ceremony. Ambassadors, Ex-Service and Regimental and civil organisations and members of the public are invited to take part in an Ecumenical Service and to lay wreaths. The Government have very kindly agreed to provide logistical support and the services of a Defence Force Band. The event is open to the public and is primarily to remember all Irishmen who gave their lives in both the first and second World War.